Minecraft created the original legacy of a true open world sandbox where players created immersive worlds and developers provided the tools to build their visions. This resulted in an explosion of unimaginable and impressive creativity by the players.Today, landscape of User Generated Content (UGC) is changing, and fast! The opportunities to tap into a digital market where consumers become producers or 'prosumers' is on the horizon. What Makes Games with User Generated Content Unique? Most game genres have a rigid and predefined mechanics. The core loop ties together core mechanics and makes players habitual to the game. Core loop also while sets players on a progression path, which follows an ever steepening difficulty curve. While most games benefit from an addictive core mechanics, true long-term sustainability emerges through an ever evolving meta game. A meta game that is driven both by designers and the players. To sum it up, the meta game allows players to exercise influence over existing design providing a sense of contribution, control and influence over the game's world. This is a typical core loop of a farming game. Player has to plant crops, make goods and fulfill orders to earn cash and experience. Experience levels up the player unlocking new content and ever more expensive content. A core loop like this is rigid, offers a singular path and is driven by game designer(s) alone. Clash Royale updates tend to deliver on every front. The beef of every update is the new content, which in Clash Royale equals to new cards. With every new card, the metagame of Clash Royale evolves. This keeps the game fresh by forcing players to learn to play with, or at least against, the new card. Metagame can vary in nature across game genres and affect different games in different ways, but primarily it involves bending or creating of rules by players themselves. This itself, in ways, differ from the rules set by the core loop. In other words, in a UGC driven game the ‘meta’ may well be the game itself. This bare bones 'text messaging' stories format app is disrupting the millennial's fiction reading habits by large. The app has a minimalistic 'no nonsense' interface - just images and a story title. Tap on a story and you will see a familiar messaging app interface with dialogues to keep reading. A Simple tap and the next line of message will appear. That’s it! The app has a minimalistic 'no nonsense' interface - just images and a story title. Click a story and you will see a familiar messaging app interface with dialogues to keep reading. A Simple tap and the next line of message will appear. Thats it! Even though it sounds dead simple, this is the way teens and millennials are habituated to consume megabytes of information today - messaging and texting. 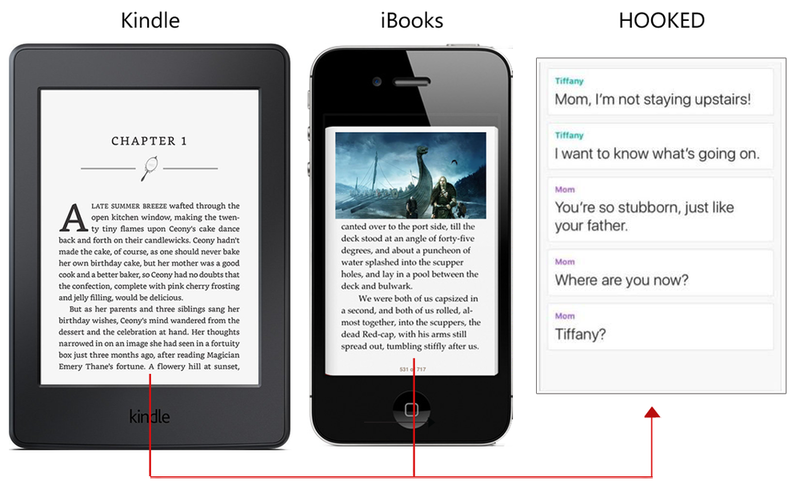 Hooked is essentially breaking apart bulk-sized story content that you see on kindle or iBooks and turning them into bite-sized text snippets for modular consumption. Hooked taps into story telling by looking at teens & millennials pre-dominant information consumption pattern - texting - and using it as a base to launch their platform.Developers of Hooked, through extensive user testing, figured out that next wave of story consumption is not in bulk sized paragraphs or even short paragraphs. Instead it was getting rid of narrative altogether! Hence, the app presents info in short SMS formats. But the best part is most of these stories are written by users themselves. Hooked encourages players to write their own stories and publish in 3 easy steps (as above). The app has a plethora of popular user generated stories at this very moment. Another interesting and noticeable stat is the community engagement the stories in Hooked are generating. 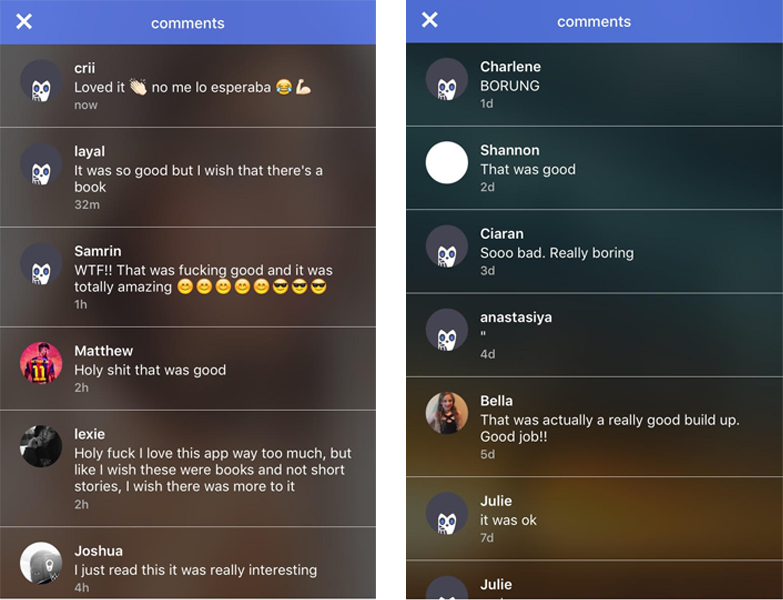 The sheer amount of comments from genuine users on the Hooked chat stories itself is mind boggling. Just to give you some perspective. I randomly picked a popular trending story on Medium and compared its likes and comments to the stories in hooked. As you can see from the image below, the stories on Hooked are beating the stories on Medium in terms of engagement. This is the kind of engagement that forced Facebook into buying WhatsApp and Instagram. Fiction and publishing houses better take note, this trend is here to stay. 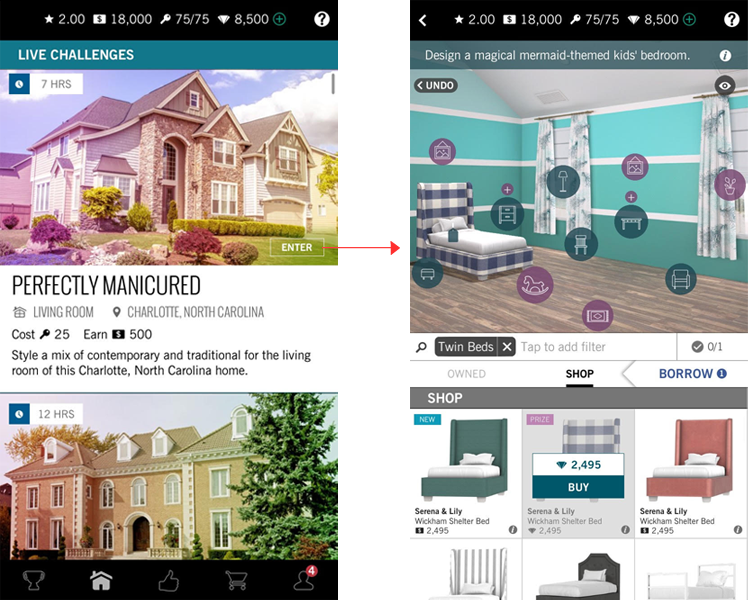 Glu’s Design Home, a perennial top 50 grossing mobile game, is a perfect example of a game that is successfully targeting a non-gamer audience. In Design Home Players take part in 24 hour challenges ranging from indoor to outdoor home decoration projects. 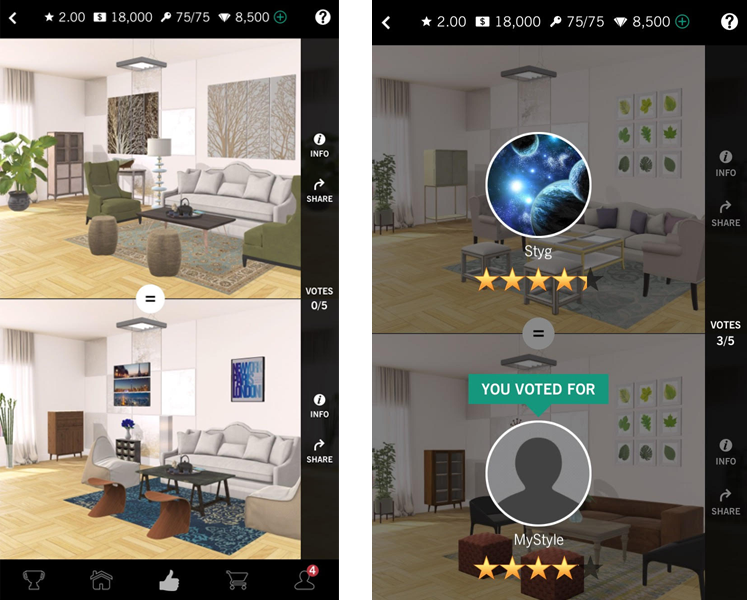 In each challenge they receive an inventory with both free and paid decoration items that they use to design interiors. 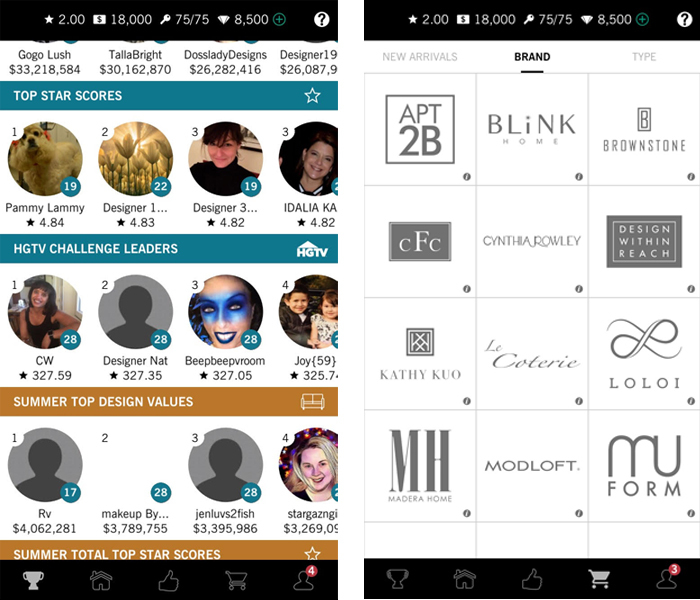 After completing the decoration challenge, players submit their work to live polls where other players will rate it. Player are rewarded based on the voting outcome. In Design Home players take part in challenges ranging from indoor to outdoor home interior design. Each challenge is unique in terms of requirements. Some challenges require the player to decorate a living room in a beach house using few of beach themed pieces of furniture while other challenges have player building living room in modern lofts with modern furniture. In each challenge player uses furniture from their inventory but due to the unique requirements, they have to purchase some additional pieces of furniture as well. After player has finished the challenge successfully, they submit it to be reviewed by other players in the game. Player is rewarded based on the star rating they receive. Player's review each others' challenges because it's a key part of the core loop. Reviewing challenges gives player Keys, which are used to submit challenges. If you don't review other players' work, you can't participate in challenges. It's not surprising to see that the majority of Design Home’s players are non-gamer women who enjoy expressing their creativity and while seeing the latest trends in interior design. But what's interesting is that the furniture players use are actual 3d models from real world brands. This helps players interact, and even purchase real furniture and decorations for their homes. Design home is thus not only an unique example of a game for non-gamer but also an forerunner in up-selling real world brands to players. Episode is a storytelling and narration platform much like Hooked. The main difference, along with being visual is that the stories branch off based on players decisions. 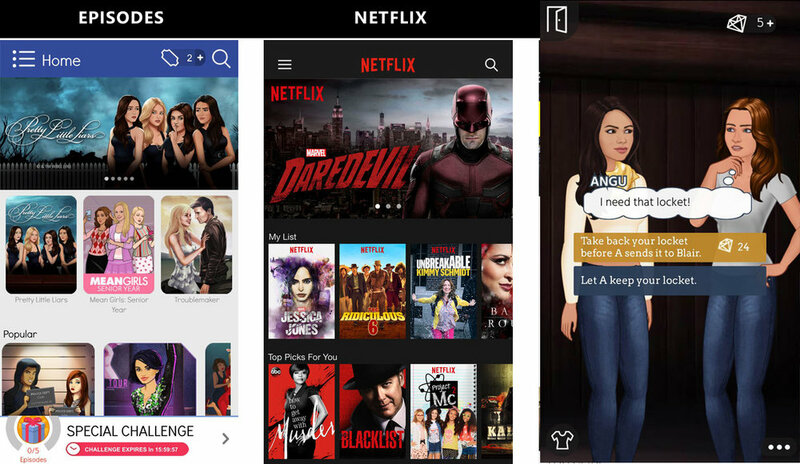 With richer graphics and images, the game utilizes an interface and model similar to Netflix and Hulu. In addition to offering a wide array of interactive storylines, Episode also offers a dedicated web platform for players to write and self publish their own stories. Pocket Gems, the developer of the game, is serious about integrating user generated content. This is apparent in when examining the sophisticated story editor they’ve built. The story editor encourages players to write and design their own stories and requires little effort on publisher's backend to integrate the stories into their ecosystem. In summary, the editor turns players from content consumers into content producers and actually allows the content producers to earn real money for their work. Roblox is a user-generated massive online multiplayer social gaming platform, which allows kids and teens to create custom games and play them with their friends. Roblox started as a web based platform where users have characters and a sandbox editor that can be used to create simple and more complex games. Today the game is a perennial top 50 grossing hit around the World. Robolox’ web roots are quite visible as you can see from screenshots above. The game carries a strong legacy from their web portal as the UX & UI for mobile leaves much more to be desired. For example, the home screen menu is in portrait mode but as soon as you select the game, it turns landscape. 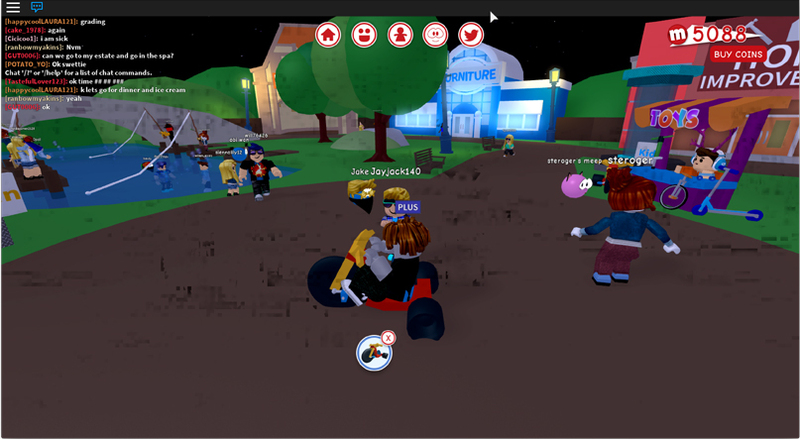 Above is an example of a game in Roblox. 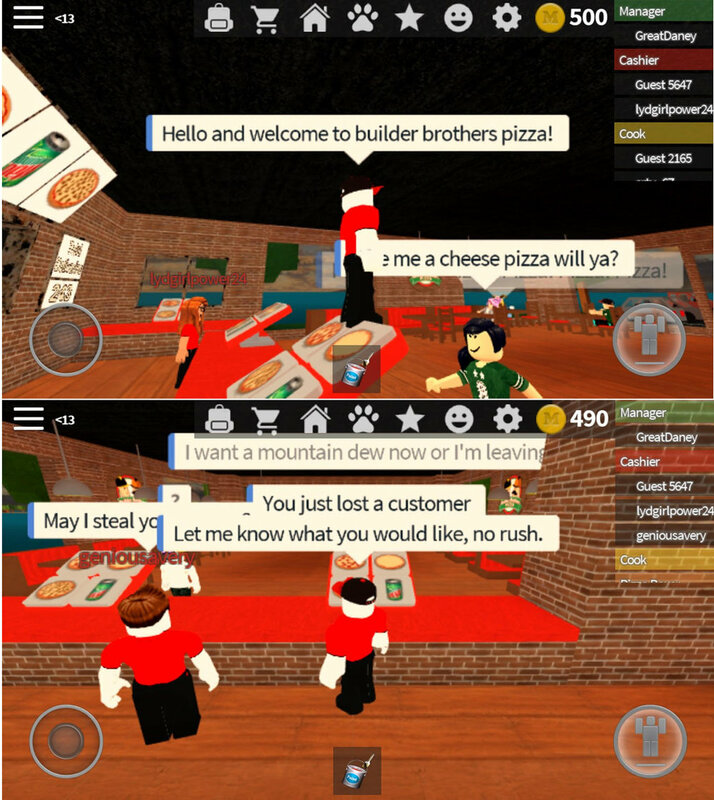 In this game player serves customers pizza and sodas as they walk. For every dish served on-time, player collects cash. This game is much like Glu’s Cooking Dash. The only difference is that this game was put together by a kid using an in-game editor provided made by the developers of Roblox. Before jumping on the UGC bandwagon a developer should also know the challenges that come along with it. Firstly, the developer needs to monitor the quality of the content produced by the players. As seen with the Roblox example below, the content created by a player may not be as finessed and aesthetics as the one designed by a game designer. Secondly, developer has to control the nature of content produced by the players. This is especially true of story-driven platforms like Hooked and Episodes where players come up with stories that are sexist, controversial or based on suggestive 'trigger themes' with the motive to gain popularity. Developer needs to have resources to monitor and vet the produced content. UGC platforms rely heavily on players to both create, distribute and market the content. This exposes creative control into players’ hands making leading to exploitation and manipulation of existing rule sets. Twist is in fact a combination of "Hooked" style horror stories with "Episodes" style story branching, so obviously big developers are doing their homework on this genre and are more then keen to experiment with it. In today's World, and especially on app stores, any successful idea is cloned almost overnight. Staying on top requires core competences or the company risks losing chunks of the market share they’ve gained. While throughout the years many tried to unsuccessfully fast-follow Mincraft, the fast follows of both Episode and Hooked have quickly gained popularity and even challenged the first movers. First reason is that there’s no more shame in creations made by amateurs. Thanks to mass adoption and usage of social media platforms, people are no longer afraid of sharing amateur videos, images and other content. Afterall, Facebook, Snapchat, Instagram, LinkedIn and Youtube thrive on user-generated content. People were more reluctant and let down by amateur attempts a decade back. There were limited audience and channels to expose the work too with harsh opinions and limited perspectives that could seriously thwart your budding hopes. Second reason is the so called IKEA effect. An effect of cognitive bias where consumers place a disproportionately high value on products they partially or wholly create. The IKEA effect explains why even creating imperfect creations, as seen in Roblox, gives more satisfaction and engagement for creators even when there are better options available. Not to mention the pride and the sense of self-achievement that comes with the experience of creating something yourself. I believe that leisure boosts creativity. Games and apps are entertainment and people play them when they have leisure or down time. When people have time for leisure, it also breeds creativity. As seen in Design Home, majority of demographics are over 30 years old, stay at home moms, who have time to spare in midst of their daily routine. They seem to use this time to express their creativity by decorating virtual homes rather than just indulging in passive relaxation like watching sitcoms.